Built in 1937 during the Great Depression, the Menno Community Hall took nearly a year to build. It began as a Works Progress Administration project to provide the rural families surrounding Menno a venue for entertainment, club meetings, and events. This WPA Rustic-style building was designed by Howard T. Blanchard of Garden City, and it was built to replace a previous community hall. Its construction was funded by the local Community Club, and the project provided important work opportunities for local men. The surrounding communities used the hall for events such as religious worship, sewing circles, 4-H meetings, plays, and talent shows. It was nominated as part of the "New Deal-Era Resources of Kansas" multiple property nomination for its architecture and association with local entertainment and recreational history. The Northrup Theater was built in 1930 by local Syracuse businessman Frank F. Northrup. At the time of its construction, the theater was outfitted with the most up-to-date entertainment technology and was able to screen both silent films and 'talkies' which included sound. The building reflects the Spanish Revival style, and it retains much of its original architectural character despite renovations that took in 1948. 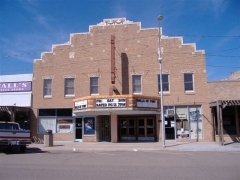 It was nominated as part of the "Historic Theaters and Opera Houses of Kansas" multiple property nomination for its local significance in the areas of recreation and architecture. Built in 1886, Potter’s Opera House is one of only a few commercial buildings that remain in Coolidge from the city’s brief heyday in the mid-1880s. The town developed in the late 1870s along the Arkansas River where travelers had once passed along the Santa Fe Trail. The Atchison, Topeka and Santa Fe Railroad built a roundhouse, machine shops, passenger and freight depots, a hotel, and tenement housing in Coolidge causing a building frenzy between 1886 and 1888. It was within this period of intense and rapid growth that local blacksmith and entrepreneur Garner T. Potter built the town’s first meeting hall and entertainment space. The building initially served an important community function as a place where churches could hold religious services and where schoolchildren could attend class. 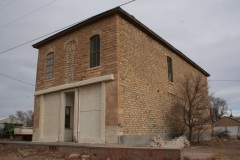 As other buildings were constructed in Coolidge, this building’s function shifted to that of a meeting hall and entertainment venue. 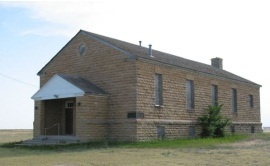 For much of the twentieth century, this two-story limestone building served as the local Masonic Lodge. The building was nominated for its association with local social history.